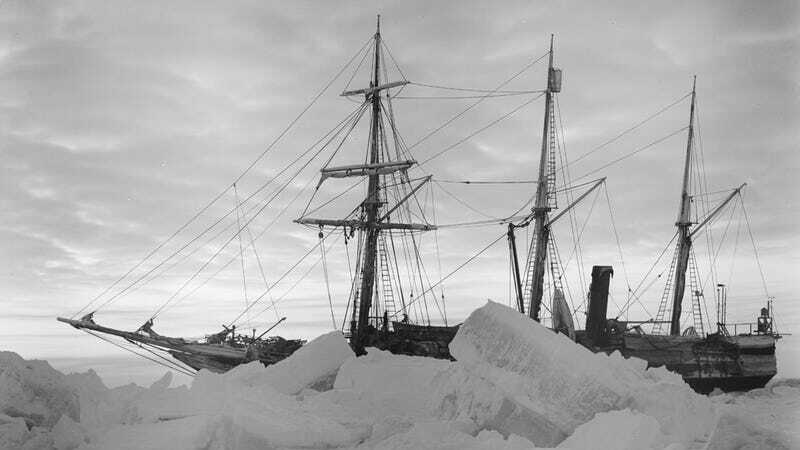 The Endurance stuck in the Antarctic ice. Early next year, an international team of explorers will investigate the area in-and-around the massive iceberg that split away from Antarctica’s Larsen C ice shelf in July 2017. As an added bonus, the researchers will also attempt to locate the wreck of the Endurance, which sunk in 1915 as part of the ill-fated Shackleton expedition. Led by the University of Cambridge’s Scott Polar Research Institute (SPRI), and funded by the Flotilla Foundation—a Netherlands-based charitable trust—the Antarctic Weddell Sea Expedition is scheduled to take place from January to February 2019, as reported by the BBC. Using the icebreaking polar supply and research vessel SA Agulhas II, the 45-day mission will truly be an international effort, involving researchers from the UK, the US, New Zealand, and South Africa. A view of the Larsen C Iceberg. The primary goal of the mission will be to explore Iceberg A-68, which calved from Antarctica’s Larsen C Ice Shelf on July 12, 2017. The astoundingly huge berg features a surface area of 2,240 square miles (5,800 square kilometers), which is about the size of Delaware or about four times the size of London. It just so happens, however, that the wreck of the Endurance—a historic three-mast ship that went down on November 21, 1915—is located nearby, some 115 to 175 miles (185 to 280 km) from the location of Iceberg A-68. Pending favorable weather and ocean conditions, the researchers will use the opportunity to search for the ill-fated ship, which rests at a depth of nearly two miles. One of the last photos taken of the Endurance. If the ship is found, it will likely be in a shattered condition. After drifting in the Weddell Sea ice for months, the Endurance was eventually crushed by encroaching ice. The ship had to be abandoned, with the crew of 28 escaping aboard three lifeboats. The survivors spent the next five months on Antarctica’s ice floes, eventually reaching Elephant Island. Expedition leader Ernest Shackleton, along with five others, set off for South Georgia Island—located 920 miles away—while the remaining crew waited. It wouldn’t be until August 1916 that everyone was rescued. The researchers will also have the diary of Captain Frank Worsley at their disposal, who kept meticulous records of the Endurance’s position. The ship’s final coordinates were listed at 68°39'30.0" South and 52°26'30.0" West. Despite this knowledge, however, three prior attempts to find the ship have failed. Should the ship be located, it will be listed as a historic monument and protected by international law. At the Larsen C Ice Shelf, the ROVs will explore the cavity under the newly exposed shelf, map the seafloor, and investigate the overhanging ice canopy. Researchers on board the ship will extract samples of ice from the shelf, which they can read like tree rings to see the ebbs and flows of the ice over time. But it won’t be easy. Earlier this year, a mission to the Larsen C Ice Shelf had to be canceled owing to treacherous conditions. It’s been over a century since the Endurance sunk, but Antarctica is still a very dangerous place.